This bill creates Solar 2.0 for Washington State. A three-year deadlock between utilities, solar installers and public interest groups finally broke today when a bill to expand solar energy access passed the Washington State House. Rep. Jeff Morris (D-Mount Vernon) sponsored the bill (House Bill 2346) and brokered the deal among all the energy interest groups. “Having worked for decades on clean energy policies I can tell you it was far easier when no one cared because there was no money in solar electricity," Morris said. "Now there is money and competing special interest groups made reauthorizing this important state program extremely difficult." This bill creates Solar Version 2.0 for Washington State. The old program would have helped build 58 megawatts (MW) of solar capacity in Washington. As passed the House the new program will help build at least 117 MW of new solar capacity in Washington. The bill would change Washington’s solar incentive rate structure and eligibility requirements. The reforms will streamline the tax credit while expanding access to local solar energy for more Washingtonians. “The bottom line is that encouraging local consumers to use solar energy is not just good for the environment – doing so provides local, family-wage jobs in an emerging industry,” said Morris. A recent study by Western Washington University suggests that the payroll impacts of the incentives are roughly $6.82 in wages for each $1 in net incentive spending. 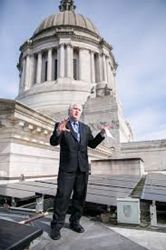 Morris introduced HB 1301 in 2013 to reauthorize Washington’s solar production tax credit. Utilities opposed that effort and came forward with attacks on net metering and wanted fixed charges to solar customers who attach to the electric grid. Issues around solar leasing brought out-of-state solar giants Solar City and Sun Run into the fight. “It was ludicrous to fend off those attacks on clean energy independence for the last three years when the utilities had presented no evidence in hearings of where the fixed charges or eliminating net metering would go except to their profits," Morris said. “Electric vehicles drive as much if not more fixed costs to the electricity lines in our local neighborhoods, but utilities make money from those customer investments so they don’t complain." With the passage of House Bill 2346 the fight for solar in Washington has gone full circle back to the concepts put forth in House Bill 1301 three years ago, according to Morris. “I know some fear exists among our utilities about the change customers want in the utility business. We will address those issues going into next session,” said Morris. “I am proud of the 77-20 vote and the bipartisan work that went into this bill," Morris said. “It’s past time that we updated our laws to make local solar power accessible and affordable for everyone."